The 2009 Houzz Holiday Party - Enter to Win! You thought that we'd let the holidays pass by without a big Houzz party? NO WAY! We all have a passion for home design and so for the 2009 Houzz Holiday Party we partnered with 20 fabulous Etsy home decor designers, who generoursly contributed their best home decor items (and the shipping cost!) to 20 lucky members of the Houzz community. Now it's time to join the Houzz party for your chance to be one of the 20 lucky winners! For your chance to win the items below, enter a comment below with the names of the stores contributing the items you would want to win (up to 5 items), as well as where in your home you would use and enjoy them (if you want, feel free to add a photo of the room in which you'd put them). Please enter your comments by Dec 16, 2009 at 23:59pm EST. We also encourage you to visit these wonderful Etsy stores, using the green link next to each item. 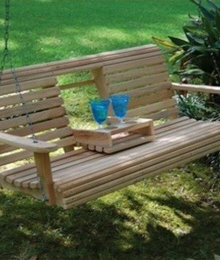 They have many more wonderful items that could make a great holiday gift, for you or for your beloved ones. If you have friends who enjoy home design, do invite them to join Houzz, browse the 20,000 photos on the site, create ideabooks AND join this party for their chance to win the wonderful items below! Etsy Store Jillian's Shoppe Giveaway 2 quilted pillows - $20 Shipping: Will only ship in the United States Each pillow measures 10in by 11in. They are created from 100% cotton fabric. 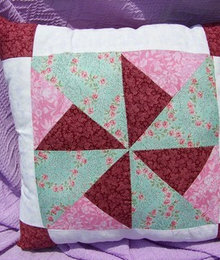 They are original designs that are hand pieced and machine quilted. The colors in the designs alternate from candy pink, burgundy, white, and green with soft pink roses. 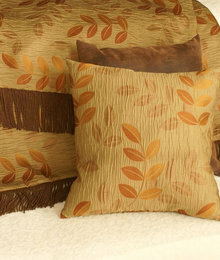 The warm colors in the fabrics will add a special touch to any room's design. Each pillow would make a lovely addition to your chair, couch, or bed. WINNER:tmoya Etsy Store Lichenwoods Giveaway Set of Three Rustic Wooden Candle Holders with Tea Lights - $24.95 Shipping: Worldwide These candle holders are made from wood we've found in our "backyard" along the Big Sur coastline after a big storm has whipped through. We only choose wood that has a mottled growth, lichen or budding that will add to its character. 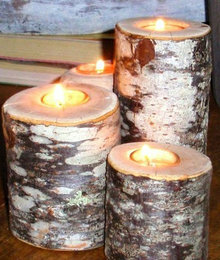 Expect a crack or two as well sometimes, for we find that only adds to the naturalness & character of each candle holder. I came up with the idea of building rustic items for home decor after visiting my sister in Ohio who lives in a rather unusual two-story log cabin. I've built wooden mirrors, coat racks, a lot of garden baskets and trivets (both for plants AND the kitchen). 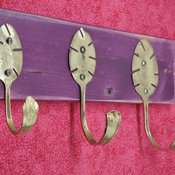 WINNER: kjmoore20 Etsy Store JJ Evensen Art Giveaway Funky spoons purple and pink coat rack - $30 Shipping: Global Funky spoons purple and pink coat rack made with vintage spoons and recycled wood. Use for coats, hats, kitchen, keys, deco, pet leashes etc. etc.. Pre-drilled for easy mounting to wall. We believe in recycling and caring for our environment, so why not do it in style with art! Together with our two boys we work and live in beautiful Door County, Wisconsin, USA. All around us in our home, at shows & worldwide, our work pushes the imagination and makes people smile! 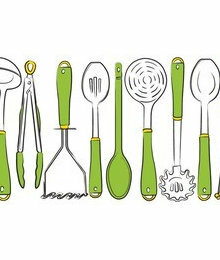 WINNER: robynscott Etsy Store Parada Creations Giveaway What's In My drawers: Kitchen Print - $30 Shipping: Global These modern looking cooking utensils will look great in any kitchen and will be sure to make all the utensils in your kitchen drawers jealous! All unique in their own way, they foster thoughts of the many dishes they aid in the creation of and inspire a chef to whip up a delicious old favorite. This is a 17" x 6" kitchen paper print. My home decor style is contemporary, I love simplicity and color. I try to uilize environmentally friendly materials and also incorporate my own prints into each room of the house. WINNER: rebalane Etsy Store Grace Hester Designs Giveaway $60 Gift Certificate to the Grace Hester Designs Etsy Store Shipping: Global Grace Hester Designs designs prints and stationery for the busy moms who appreciate modern and personalized products. Most of the designs are silhouette or typography-based so the overall visual is simple and fuss-free. From birth date or wedding date keepsake prints, to flashcard-styled prints in different languages, each design is inspired from a real need Grace has experienced as a mother of two young kids. An example is the family keepsake print shown here - this is a personalized gift that is just perfect for an entire family to receive and enjoy as a gift. 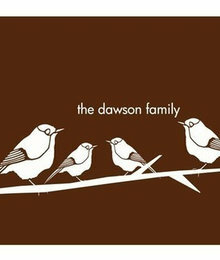 She can customize it to your choice of colors, count of family members, and add names of the family members if provided. 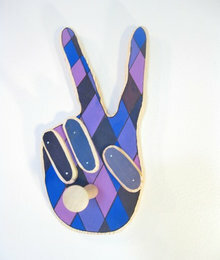 WINNER: ohbrooke Etsy Store Rowans Room Giveaway Vintage Mirror - $65. Shipping: Will only ship in the United States All of my mirrors and chalkboards are made from recycled antique cabinet doors, and recycled antique wood scraps. They are all one of a kind, therefore no two are exactly alike. 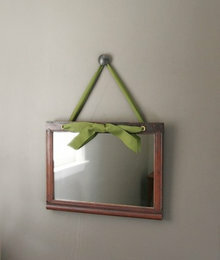 This mirror has such a beautiful frame and comes threaded with one of my latest ribbon finds. It is a 1" thick moss green grosgrain ribbon. 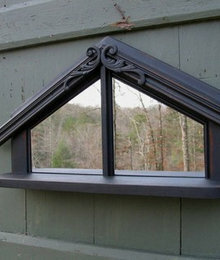 The frame measures 16.5" x 13" and is a rich dark brown. 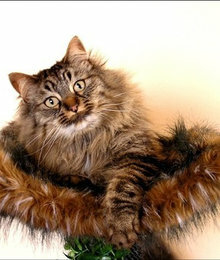 WINNER: meola Etsy Store Incredible Cat Loveland Cat Bed - $75. Shipping: Will only ship in the United States Giveaway Our Loveland Cat Bed is a wonderful way to spoil your kitty and the perfect solution for keeping your cat off of your keyboard. Kitty can curl up in plush faux fur on your desk while you work, or place the bed where your cat loves to sleep... by a favorite window, near the fireplace, etc. Our shred-proof faux fur is available in beaver, polar bear, brown or black mink, or snow leopard. Choose between 8.5” or 12” high. Organic catnip included. Our luxury cat furniture is handcrafted by us in our workshop attached to our home, which means every cat condo is given love and attention only the creators can give. WINNER: megardengal Etsy Store Visualingual Placemats - $54. 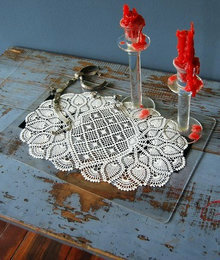 Shipping: Will only ship in the United States Giveaway This set of 4 placemats, upcycled from clear acrylic gas station price numbers, measure 11.5 x 17 inches and feature a black number on one side with a white screenprinted doily design on the other side. Modern design on one hand, and an homage to grandma's house on the other! These placemats were created in a limited edition by VisuaLingual, a small design studio based in the Over-the-Rhine neighborhood of Cincinnati, Ohio. In our home and in our work, we believe in meaningful functionalism. Our live/work loft is Modern, yet eclectic. 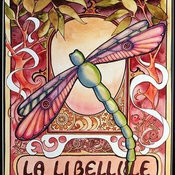 WINNER: lhawke Etsy Store Peggithas Pieces Dragonfly Print - $75. Shipping: Global Giveaway I love dragonflies and this homage to one of my favorite design styles, art nouveau, was a ton of fun to paint! This 12" x 16" print is a limited edition reproduction of an original watercolor painting by award winning artist Peg Lozier. It will be delivered to you with a mat and backing cut to fit into your own 18" x 24" frame. Epson Ultrachrome inks and watercolor paper have been used to insure a long life and vibrant color. I've hand signed and numbered the print. I'd be hard pressed to find a name for my own personal décor style. My home is a reflection of all the things I love. Bright colors, warm spaces, and big comfortable sofas provide the basics. 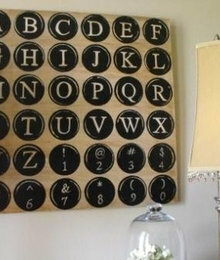 WINNER: heart4six Etsy Store Susie Harris Vintage Typewriter Keys Hanging - $98. Will only ship in the United States Giveaway This vintage typewriter keys, a classic icon, is artfully hand painted on wood by Susie Harris. Paying close attention to detail, she distresses, stains, and seals each piece by hand for a character-rich patina. 24"x24" hardware included. My passion is decorating my home on a budget and creating things to fill it. My style is a mixture of Modern meets cottage with a touch of vintage nestled in between. My favorite colors are browns and blue but that changes often around here. Paint can do so much for so little. WINNER: rhoda_southernhospitality Etsy Store Turtles Creek Originals Shabby Black Shelf - $125. 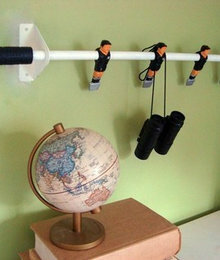 Shipping: Global Giveaway Wonderful Old Wooden Shabby Black Shelf for an entranceay! Double your light & create a warm ambiance with tea lights or voltives. Dressed in our carriage black, we made this treasure from a vintage table, a re-purposed mirror, upcycled trim and floral appliques. We then added the famous Turtles Creek Touch! It's ready for a NEW HOME with Beautiful YOU! We live in the North Georgia Mountains near the Appalachians. Living up in the ridges, hearing the waterfall below only inspires us to keep our home rustic and earthy. From an 1800's Primitive Firkin Bucket on our Stone Hearth to the Victorian Era guest room, we try to recycle, re-purpose everything that we have in our home. WINNER: jessadee77 Etsy Store Pillow Throw Decor Pillow and Throw Set - $169. Shipping: Global Giveaway Get the custom "Luxe Look" with this designer matching pillow and throw set. It’s a fabulously warm 60x40 inches cover up and a chic sophisticated accent to a living room chair or bed. It has a stunning subtle copper shimmer and a rich textural feel. Same front and back "for the trade only fabric" from Maxwells Fabrics is accented at both ends with a luxurious 5 inch copper fringe and interlined with heavy bump interlining. 20 inch throw pillow cover (insert not included) has concealed zipper and designer corners for smooth custom look. Custom sizes available. 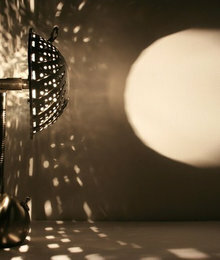 WINNER: anny Etsy Store Lightexture SteamLight Micro Lamp - $169. Will only ship in the United States Giveaway The SteamLight Micro Lamp is small creature like desk lamp. It creates light textures around it and has a patent pending iris mechanism with which its task light can be enlarged, reduced and rotated. It has a toggle switch in its belly and uses an energy efficient xenon light bulb. We do ship internationally but the lamp works on 110V so most places outside the US will require a small common voltage adapter. 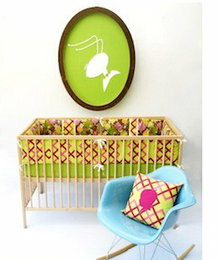 WINNER: sethsgal Etsy Store Aunt Bucky Bedding Crib Bumper Set and Sheet - $175. Shipping: Worldwide Giveaway Aunt Bucky ‘Winky Wonderland’ Crib Bumper Set and Sheets Reversible crib bumper set in Chocolate Brown & Lime Green colorway: fantastical forest scene on one side w/ lattice like patch work insets & a continuous lattice like geometric print on the other. Set includes two (2) 10 inch x 80 inch crib bumper guards with 4 ribbon ties sewn along both the top & bottom edges of each bumper guard with our signature repeating 'Made w/ Love Aunt Bucky' design. Adorable Crib Sheet in bright green print w/chocolate brown and yellow oval dot pattern. Bumper Set and Crib Sheet 100% Cotton and made in USA. WINNER: vdr928 Etsy Store The Shabby Home Romantic Louis XV chair - $225. Shipping to the lower 48 US states only. 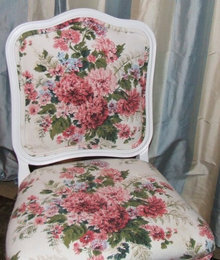 Giveaway This Romantic Louis XV chair is upholstered in my favorite vintage backcloth ~ with lots of pretty color. It’s painted in a creamy white. I smile every time I look at it… It reminds me of a summer garden of sweet smelling roses… the sun shining… with children playing about. Perfect for a beautiful shabby décor! I am willing to package and ship via Greyhound Package Express to a terminal nearest your address. The winner must make arrangements to pick up at the terminal. If you wish to upgrade to UPS – there will be a charge depending on your location.